Today, I am featuring a "Masters Tablescape." One of the oldest springtime traditions in the South is the Masters Golf Tournament--The Augusta National is steeped in tradition. As the commercials say, "The Masters is a tradition like no other." I grew up in Augusta and got my "Coppertone Tan" every spring on the 16th green. 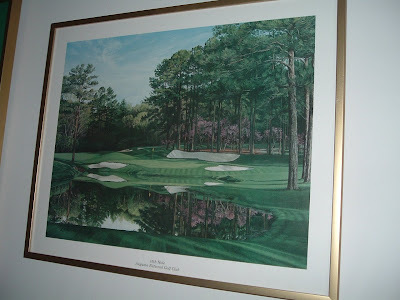 Many years later, my family still goes out to the Masters Golf Tournament to enjoy the golf, the latest fashions, dogwoods and azaleas in bloom, and the food. 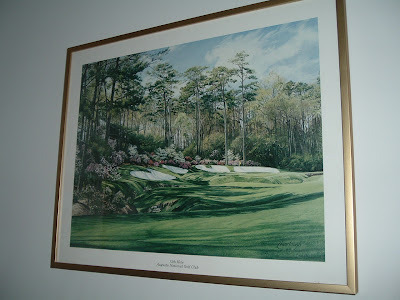 An Augusta National print on the wall of my husband's "Romper Room," the "16th Hole"--where all the locals hang out! 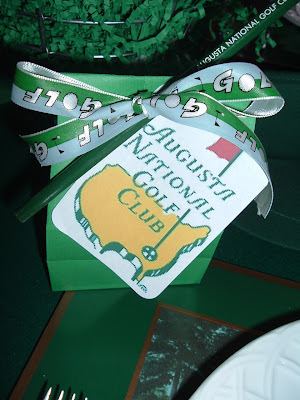 If you are lucky enough to attend the Masters, remember to practice proper "Augusta National Etiquette." ~No running, loud talking, or yelling. ~Applaud successful strokes; never applaud or cheer the misplays of a player. ~Thou shalt not litter at the Augusta National...it is hallowed ground to golfers. 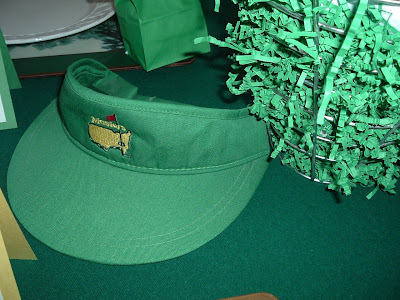 ~Don't wear green on Sunday at the Masters...it's disrespectful to the golfer who will don "The Green Jacket." ~Conservative golfwear is the appropriate attire...keep it preppy! Each year, the winner of the Masters Tournament is presented with the famous "Green Jacket." It's definitely a golden moment for the winner! He gets to take the jacket home with him and keep it for one year. Upon his return to the tournament the next year, he gives the jacket back to the club. After that, he can only wear the jacket when he visits the Augusta National Golf Club. 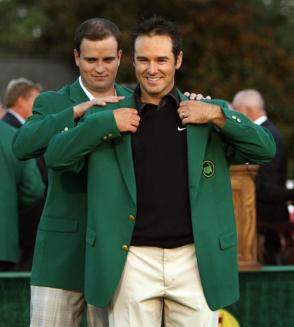 Here is a photo of the 2007 Masters Champion--Zach Johnson, presenting the Green Jacket to the 2008 champion--Trevor Immelman...The big question--Will Tiger win his 5th this year???? Barbeque sandwiches, ham on rye, the beer gardens...all remind me of those fun days in Augusta. But, the pimiento cheese sandwich is the crowd favorite at the Masters. The sandwich costs $1 and is considered a delicacy by the golf fans--it's simple, it's southern, and it's a tradition. Of course pimiento cheese sandwiches, cut into triangles and trimmed of crusts, are also favorites at bridal receptions, showers, and teas all over the South. The Junior League of Augusta has published three great recipe books. Tea Time at the Masters, Tea Time at the Masters--Second Round, and Tea Time at the Masters--Par Three. These are all must-have cookbooks for Southern ladies and you will find a lot of recipes inside that are favorites among Augustans. Combine the white cheddar cheese, yellow cheddar cheese, bleu cheese, parmesan cheese, pimientos, mayonnaise and Dijon mustard in a food processor and process until smooth. Remove to a bowl. Cover and chill. 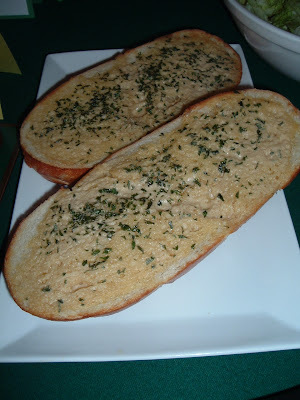 Spread on white bread to make sandwiches. Combine 1/2 iced tea and 1/2 lemonade in a pitcher and fill with ice. Serve and enjoy! Every year my friend Teresa Jane welcomes my husband and one of his lucky friends he chooses to attend the Masters into her home during Masters week . 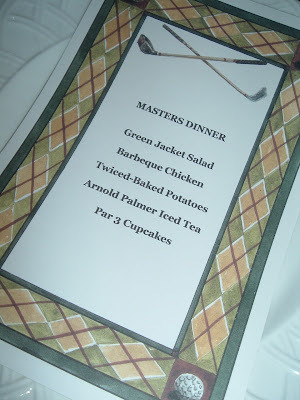 For as long as I can remember, Teresa Jane has been hosting her "Masters Dinner," with the same delicious menu year after year. This year Masters Sunday falls on Easter Sunday, which it frequently does. My husband decided to skip going to Augusta this year. 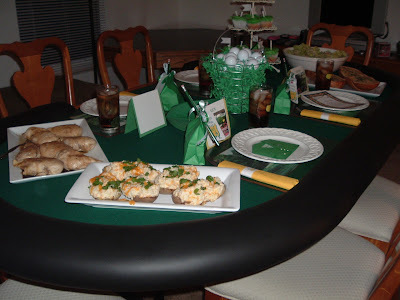 A couple of days ago, he hosted game day/night/early morning in the "Romper Room at the Roost" to kick off the Masters Golf Tournament and play Poker, while enjoying the foods I prepared from Teresa Jane's "Masters Dinner." Teresa Jane is an avid scrapbooker and awesome cardmaker. She designed these oh-so cute invitations for the event. 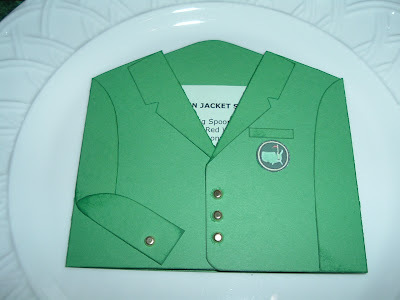 The invitation is in the design of "The Green Jacket." When the invite information was removed, it revealed the recipe for the famous "Green Jacket Salad"! Aren't these just perfect for a golf event! The jacket even has the little Augusta National logo on the pocket!!! 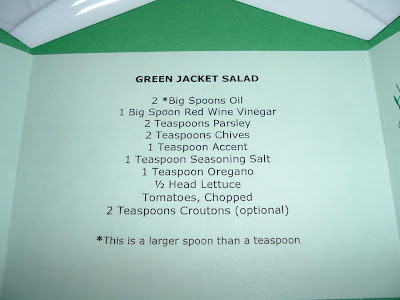 Here's the recipe for the famous "Green Jacket Salad." 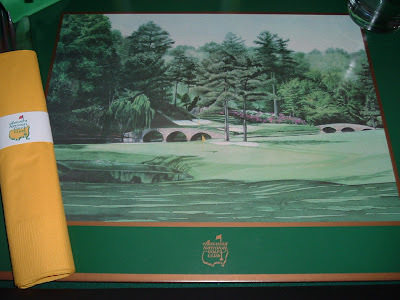 The Green Jacket Restaurant was THE most popular restaurant in Augusta for many years. 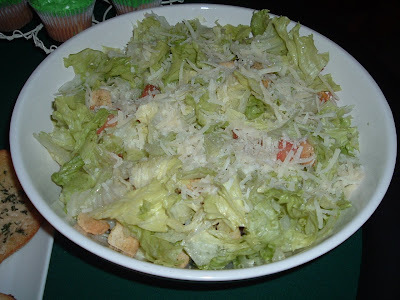 This is the recipe for their house salad and it is awesome! If you decide to make this salad, do not add the dressing until just before serving. This dinner was served on a Poker table, family-style--which is appropriate for an informal occasion. 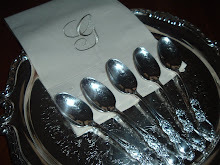 The food was placed on the table in serving dishes and passed around by each guest. I purchased these white plates at Pier One years ago and the tumblers are from the Augusta National Gift Shop. Bake/grill chicken breasts. Add all ingredients to a medium pot and simmer over low heat. 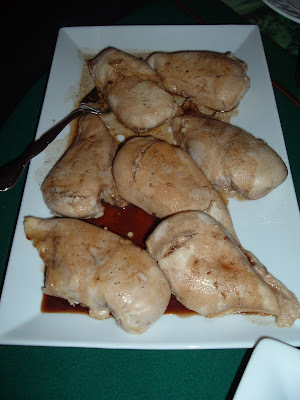 You may brush the chicken with sauce while cooking and then transfer the sauce to a serving bowl at the table. You may bake the potatoes in the oven at 350 degrees for one hour. (I microwave them for ten minutes) When the potatoes are done, allow to cool for ten minutes. Slice potatoes in half lengthwise and scoop out the flesh into a large bowl; save skins. Add all the ingredients except the green onions and 1/2 cup of the cheddar cheese to the potato mixture. Mix until creamy. Top with more cheddar cheese and chopped green onions. Place in the oven and bake for 15 minutes. Get Your Party Favors Y'all! 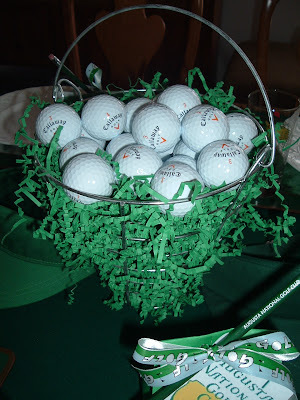 Gift bags with golf balls...what else??? I attached an Augusta National pencil to the outside--my daddy gave me tons of these Augusta National pencils years ago. And the wooden shafted legend of Bobby Jones. 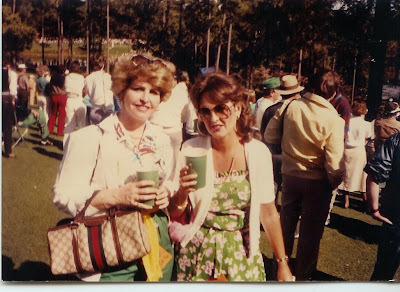 Here's a photo from the 80's of my best friend Teresa Jane and me at the Par 3 Tournament in Augusta...fun times! It's definitely springtime in Augusta. My brother was at the course yesterday and said the flowers were all just gorgeous. Springtime in Augusta...nothing like it anywhere y'all! What a cool idea!!! As usual, your table is perfection! I love the photo of you and your friend! Great vintage Gucci! Oh Miss Janice...perfection again! The invitations that Miss Theresa Jane made are adorable! I had no idea about the JL Augusta Masters cookbooks- adding these to my MUST purchase list as soon as Lent is up in a couple of days- no Amazon for this little bubble! I've got a Masters post up my sleeve- but it's silly. PS- Seve Ballesteros won the year I was born- I was always so jealous that Jack Nicklaus won the year that my sis was born- my fav' of all time! I cannot lie- I've never warmed up completely to Tiger or Phil M.
What an amazing post per the norm! Queen Bee...Miss Janice LOVES Seve! Oh, I enjoyed this magnificent post today, Miss Janice. We always watch the Masters...Mr. Sweet Nothings loves golf. I am not a player but I do love watching it.I remember the year P. Mickleson won and I cried like a baby. He so deserved to win. I'm pretty sure Mr. Woods will get it again...he is so awesome..the most awesome player ever, I would say. 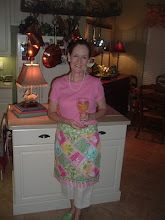 Thanks for all the great recipes..I am going to try the P. Cheese...out here in West Texas, we love it, too!! Oh Miss Janice I was just SO excited to see this post!! Like Queen Bee, I am a big Masters fan! I work at a golf magazine so of course I love all things golf. The tablescape, gifts and everything are just too precious. 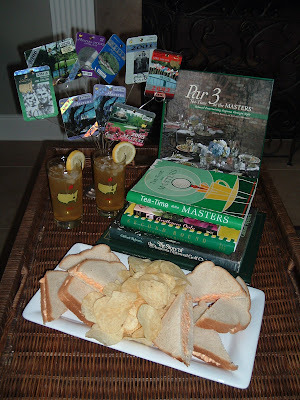 I am just dying to go to the Masters and have a pimiento cheese sandwich! How exciting to have grown up in Augusta. All the traditions of the Master's that you shared with us are so cool. It is a tough year for Master's parties this year since it falls on Easter Sunday. My son has a party every year and is going ahead with it any way. I am not sure what the turn out will be but he is young and has lots of friends that have yet to start families so it might go alright. 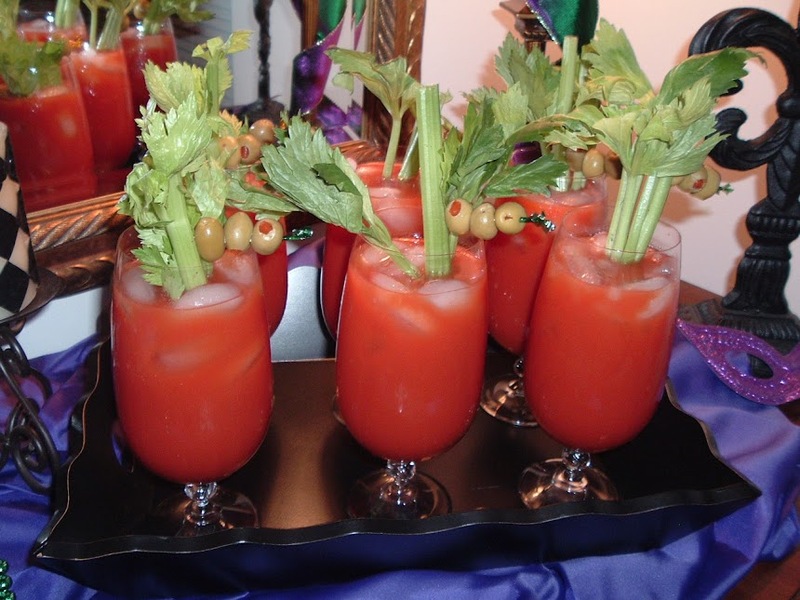 He hosts the party at our family's golf course so after the brunch is finished the staff will set up for the Master's party or I would surely use some of your great suggestions. I just might make some pimento chesse sandwiches any way. Great post. What a wonderful idea Miss. Janice! We love to watch golf, play golf and talk golf in our family. This is perfect! I may have to give the menu a try on Saturday! Thank you for your fun post! 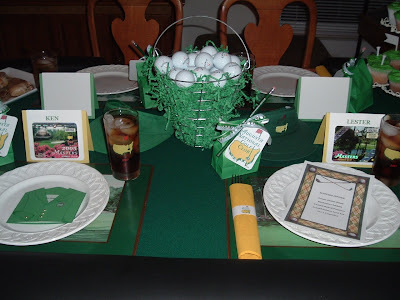 This is wonderful - so will your table set for Easter this year or the Masters? Both you've shown look wonderful! On your salad, did I notice that you've also added some cheese to the recipe? All of this looks wonderful and the recipes are ones I'm going to try soon! Miss Janice your tablescapes are just amazing! I always look forward to reading your posts! My husband has always wanted to go to the Masters, but never has. I thought he might get the chance when we lived outside of Columbia. He's going to hate it this year b/c we're going to be on the road, and he won't get to see as much of it. 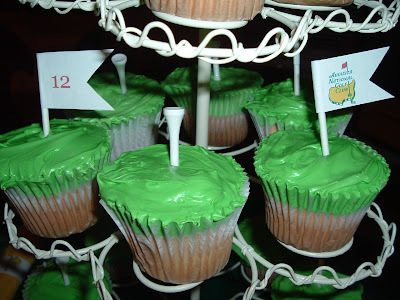 Love the "Masters party" idea! Hope your friend is doing better! What a coincidence that you posted this today. My daddy and I are huge golf fans and he is an avid golfer. He attended the Masters for many years but since retiring, he hasn't gone back. Today, we watched the Par 3 tournament, discussed the tourney, Greg Norman playing again with an honest chance of winning the green jacket (although it will probably be Tiger again) and how gorgeous Augusta National is. We also talked about the $1 pimento cheese sandwiches (he also loves the egg salad sandwiches they sell as well) and I told him about Tea Time at the Masters cookbooks. Thanks for the wonderful menu, I will definitely use. I think I may just have to have my very own Master's Sunday Dinner next year. My fave is Phil as he is short and lefty like me! I cried when he won his green jacket. Par 3 day is the best as the kid's players run around and caddie and even get to hit the ball some...very relaxing. It was great to see Jack, Arnold, and Gary Player playing together today. 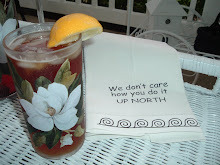 Thanks for a wonderful post today and could you share the recipe for Arnold's Ice Tea? What fun! I have to take notes on this..the US Open is here on LI in June...We have had a few Opens here in Southampton, ..Hal Sutton rented my neighbors house years ago. And BTW, did you know Lilly Pulitzer is from here too? No wonder I like her! What a terrific post tonight...I have to say I was getting a bit tired of Bunnies!! 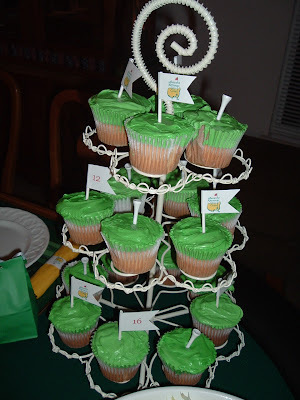 it is so perfect from the centerpiece to the cupcakes...My father always wanted his ashes sprinkled over the course in Augusta...he was a lifetime golfer...your tablescape brought back lovely memories of him...Thank you...Sue. Very, very fun. 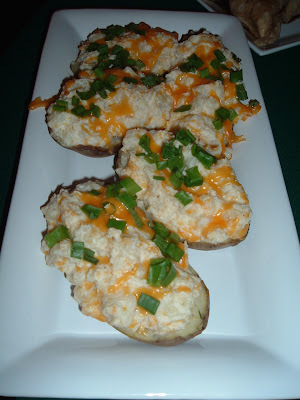 The twice baked potatoes look wonderful. Anabelle thinks the cupcakes look good! I also like the picture of you and Teresa Jane, it's so fun to have special friends. Hope you have a wonderful Easter! Miss Janice this table is fabulous! I love the post! You also reminded me, it's been far too long since I made pimento cheese sandwiches! I think I'll do that, tomorrow! What a wonderful party! Love the cupcakes -- very clever. All of it is clever actually -- love, love, love it! We have a town in Kansas also named Augusta -- they call their golf tournament "The Little Masters"! It's a small community fundraising golf tournament -- no celebrities there -- no green jackets either! Perfection! I loved so many things about this tablescape-the golf ball centerpiece, the tees and flags in the cupcakes and those awesome invitations. I love the idea of placing a recipe in there once the invitation is used. 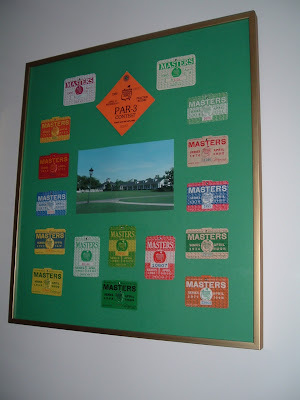 Thank you for the lovely history lesson and etiquette on the Masters! I'll have to check out the cookbooks. How clever is this? I love everything. The invitations are just over the top. The recipes sound yummy. I love pimiento cheese sandwiches. Very cute. Miss Janice! What fun this is! I love it and now I am so hungry!! Now I wish you'd do a "Pageant Etiquette" post. Just like not wearing green to reserve the 'green jacket' for the winner, I don't like to see other title holders wear their crowns to Miss America, or other pageants. Only the winner of that pageant should be wearing a crown that day. 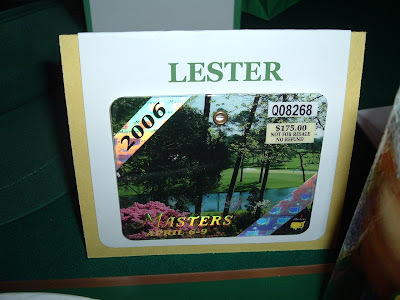 I've always wanted to go to the Masters! The course is so beautiful. What a great idea and fun for all of you. Great job! Love the photo of you and Theresa Jane. You two are gorgeous ladies! You are an amazing hostess as well. This is superb! The rich Greens look stunning and the recipes all sound delicious. I'm trying the twice baked potatoes for sure. Have an enjoyable and blessed Easter. What a great green table. I also love all the wonderful touches you added! And the jacket invite looks great! Oh! Your creativity is unsurpassed on this table! Excellent! Every detail is perfect and the menu looks delicious! Just love those invites and the cupcakes. Very clever idea., kudos again! 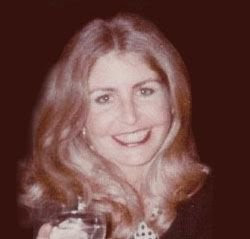 Miss Janice, Dear One, you are truly amazing! I LOVE THIS! My husband would flip! Did you see the pictures of Dudley Hart & his triples on the gree?? SO CUTE! I posted about it on my blog. You may have outdone yourself on the 'fun factor' for this one Miss Janice! The Spousal Unit stopped dead in his tracks when I was scrolling past the invitations, "Those are cool!" The JL cookbooks sound divine, and your menu too yummy! The Par 3 Tournament was on all afternoon here at the Prepatorium, like so many others, this is our favorite one to watch of the majors! 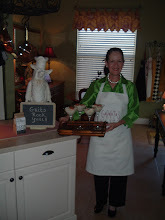 Thank you for sharing once again of your incredible style and flair for entertaining! May you and yours enjoy a warm and wonderful Easter/Masters weekend! Sure do love your Southern Charm! Living in the Pacific Northwest, there aren't alot of rituals.It is always fun to see what you are doing. Thanks so much for your sweet comment on my blog Miss Janice!! 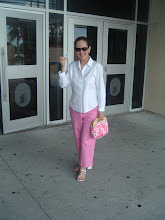 Lady Katherine is definitely a special lady and friend!! I have a girls club 8-12 years old that I am currently covering etiquette with. Sure wish I had someone like you for them to learn from! They will be using their etiquette and food prep abilities to be hostesses to their moms at our Mother/Daughter tea in May. They didn't think etiquette was going to be much fun, but have really enjoyed it so far. We will be covering table setting and table manners next Thursday. Love the Master's post, too. My father-in-law lives in Bayhill and has had us over for that tournament before. Very interesting! Love all that you and your friends do; so very creative, and that photo of you both is adorable!! It's great to meet you!! I will be back often!! omg! I love all the Master's stuff!! Great photos, I love it all! The cupcakes are so fun! The Green Jacket that every golfer dreamed of and would make them popular. The wonderful foods that I love to taste, the salad and barbecue chicken. Congratulations to My Giveaway Winner!!!! Just In Time For White-Shoe Season!